Many Texas residents look forward to attending the State Fair each year, and there is no questioning why. A tradition since 1886, the State Fair of Texas has something for everyone! With the 2017 State Fair opening on Friday, September 29, you definitely want to get there to join in on the fun, but don’t pay full price for admission! Friday, September 29, 2017: On Opening Day, all active military, retired military, and veterans receive FREE admission when they present valid documentation of military service at the gate. Spouses of service men and women with a valid Military Spouse ID and accompanying children under the age of 18 will also receive FREE admission. Friday, September 29, 2017: Fairgoers can bring a full 20 oz. bottle of Dasani water, or any 20 oz. Coca-Cola product, for donation to the North Texas Food Bank and get admission for $10. Friday, October 13, 2017: As a special tribute to their service and dedication, the State Fair will host First Responder Day recognizing the various organizations of first responders and their contributions. First Responders Day includes free admission to the 2017 State Fair of Texas for all first responders when they present a valid badge or ID card from their department or organization, plus up to three admission tickets for their family members. Valid documentation must be presented at the gate. Dr. Pepper reduced admission after 5pm: Any day after 5 p.m. Bring an empty Dr Pepper can and enter for half off. Tuesday: Every Tuesday, bring an empty Dr Pepper can and get admission for $6. Wednesday: Bring 4 cans of food for a donation to the North Texas Food Bank and receive a coupon for a $4 admission ticket. One (4 can) donation per person. Discount may not be combined with any other offers. Thursday: Bring an empty 20 oz. bottle of a Coca-Cola product and enter the Fair for $7 admission on Thursdays. One bottle per person. Discount may not be combined with any other offers. Guests can save while snacking during Thrifty Thursdays, where participating food vendors offer one of their signature menu items at a reduced price, ranging from mini versions to regular-size items. KISS Fridays: Download and print a coupon from the KISS-FM website. Save $5 with the coupon. 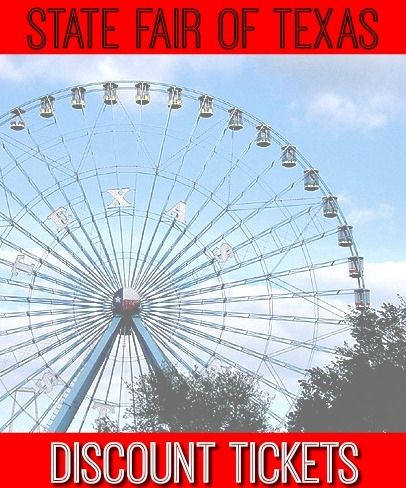 Discount is off of general admission only – when purchased at a State Fair of Texas admission gate with coupon. McDonald’s — McDonald’s offers a discount on children’s general admission with their State Fair coupons (find these on tray liner or on your bag). Bring your coupon to the gate and save $5 off a general admission ticket or half off a children’s tickets (with purchase of general admission). One coupon per person. Discount may not be combined with any other offers. Kroger — Discounted General Admission and Season Passes: General Admission tickets purchased in advance are $16.50; season passes are $34.95 and include a one-day companion ticket (good Monday-Friday). Ride the Dart: Consider taking the dart to get into the fair grounds and save on parking! Food and Ride Coupons are sold for $0.50 per coupon. These coupons are also sold online, in sheets of 20 coupons. From past experience, each ride will take anywhere between 2 and 10 tickets each. For more information on the State Fair of Texas, visit them online. Has anyone tried using the $5 coke bottle entry deal on Thursdays? We are coming in from out of town and want to be prepared. Does it need to be a DFW area coke bottle with a specific label or is any 20oz coke bottle good? Awesome! Thank you for this list of state fair discounts!